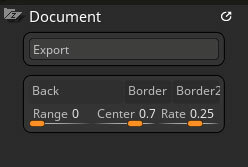 The Export button exports the current view of the model as an image file in a variety of formats. For best results, do a BPR render first, using the settings in the Render palette. The Document Background Color swatch displays the current document background color. You can change this color to the current Color palette setting by clicking this swatch once. You can also click this swatch and drag to another point on the canvas or interface to select the color at that point. The Document Border Color swatch displays the color of the border around the document window. It also affects the Lightbox background color. You can change this color to the current Color palette setting by clicking this swatch once. You can also click this swatch and drag to another point on the canvas or interface to select the color at that point. The Document Border 2 Color swatch displays a second color for the border around the document window. It is blended with the Border color above. You can change this color to the current Color palette setting by clicking this swatch once. You can also click this swatch and drag to another point on the canvas or interface to select the color at that point.